The Jumbo Afro Clown Wig is a super-sized version of our Deluxe Afro Clown Wig. The Jumbo Afro Wig is bigger, better, and hairier! 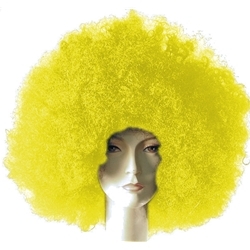 Made of synthetic fibers, the Jumbo Afro Clown Wig is available in a wide range of bright colors. The wig features an elastic band on the inside for comfortable one size fits most sizing. This is the perfect wig for disco dudes, clowns, and any number of other creative characters. Don't forget a wig cap for a more secure fit and a wig stand to help organize your wigs and keep them neat and tidy.